Your morning coffee connects you to millions of women coffee farmers across the world. While these women have always played a vital role in coffee production, they weren’t recognized or directly compensated for their work. In 2004, a few of these women decided to change this by co-founding Café Femenino® alongside Organic Products Trading Company. For the first time, women were recognized as coffee producers and paid for the coffee they produced. These women have made sure that when you choose Café Femenino, you’re choosing much more than a specialty coffee. You’re choosing to help women take on leadership roles, obtain the title to the land on which they farm, and earn an extra premium for their high-quality coffee beans. In these ways and more, choosing Café Femenino means you’re choosing to stand with women coffee farmers fighting for the credit they deserve and the voice they need to empower themselves and their communities. 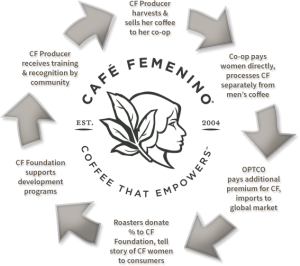 Café Femenino Foundation is an independent nonprofit organization that funds community betterment grant requests proposed and managed by women in coffee producing regions around the world. Foundation volunteers work throughout the year in various fundraising activities that directly support women, their families, and their communities.OPTCO is an annual donor and proud sponsor of the Café Femenino Foundation and encourages roasters to join in that support through donations and fundraising events of their own. 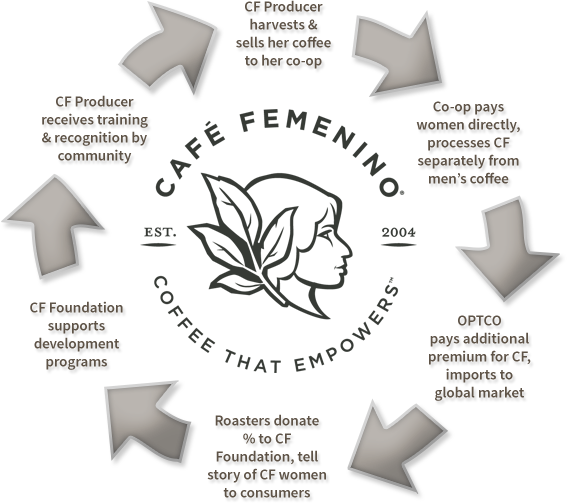 Learn more at CoffeeCan.org.